RIDM 2017 Review: Do Donkeys Act? The documentary film Do Donkeys Act? was shot at four donkey sanctuaries, including one in Guelph, Ontario. Do Donkeys Act is a charming, calm, contemplative film that just shows donkeys doing what donkeys do when left to their own devices. There are no experts explaining the evolution of donkeys, their place in history, or whatever. I had a moment of dread when I saw a sign on a wall that said “knock down box.” I thought it was another way of indicating euthanasia, but no, the donkey was being given an injection to knock him out in preparation for surgery, surgery that looked like it was done on an inflatable mattress. The most surprising thing for me was the great variety of sounds that a donkey can make. 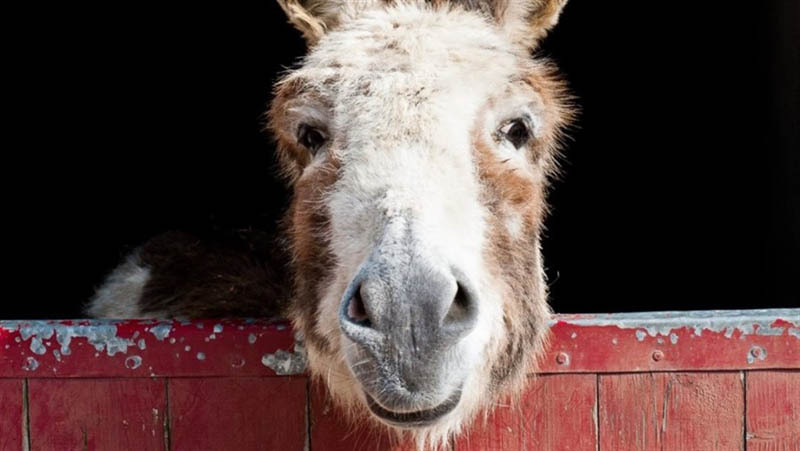 Braying, sure, I’d heard that before, but a donkey can also sound like a barking dog, a purring cat, a squeaky door, a foghorn, a whistle, a trumpet, or a wheezing asthmatic. 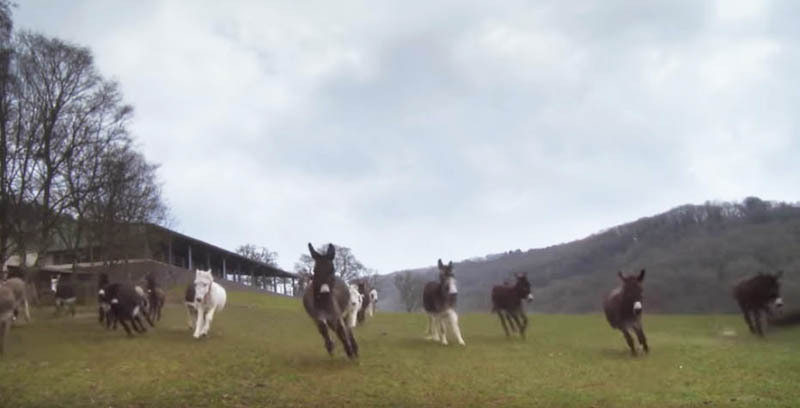 Donkeys enjoy a spirited run in the documentary film Do Donkeys Act? Most of the talking in this film is done by Willem Dafoe, and I have very mixed feelings about that. He does a fine job and seems to be enjoying himself at times, but I’m not sure that the words he was given to say contribute that much to the film. Sometimes they interrupt the mood. Google tells me there is another version of the film, called Sanctuary, that does not include Dafoe. Do Donkeys Act? will be shown Sunday, Nov. 19, 2017 at 4 p.m. in Salle Fernand-Seguin of the Cinémathèque Québécoise, 335 de Maisonneuve Blvd. E.
RIDM (Rencontres internationales du documentaire de Montréal) ends on Sunday, Nov. 19, 2017. 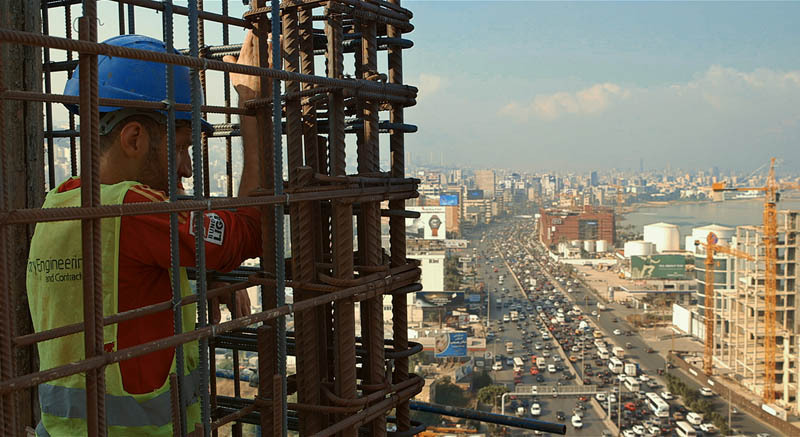 In the documentary film Taste of Cement, Syrian construction workers build a highrise in Beirut, Lebanon. Taste of Cement is a melancholy, sympathetic, and arty documentary about Syrian construction workers in Beirut, Lebanon. They are building a high-rise apartment building near the Mediterranean shore. When their working day is over, they retreat to bare-bones lodgings in the building’s basement. No commute time! 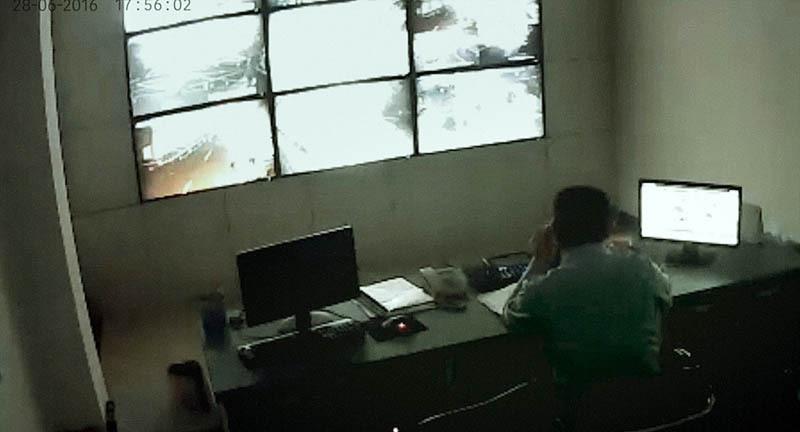 But it’s a dark place, divided into haphazard units, with little privacy, and no security for valuables that I could see. Water dripping from above leaves puddles here and there. The living quarters are quite far from the entrance, which must contribute to a sense of claustrophobia. What’s the air like down there? Some men have makeshift beds, while others sleep on thin mattresses or pieces of cardboard placed on the floor (ouch). 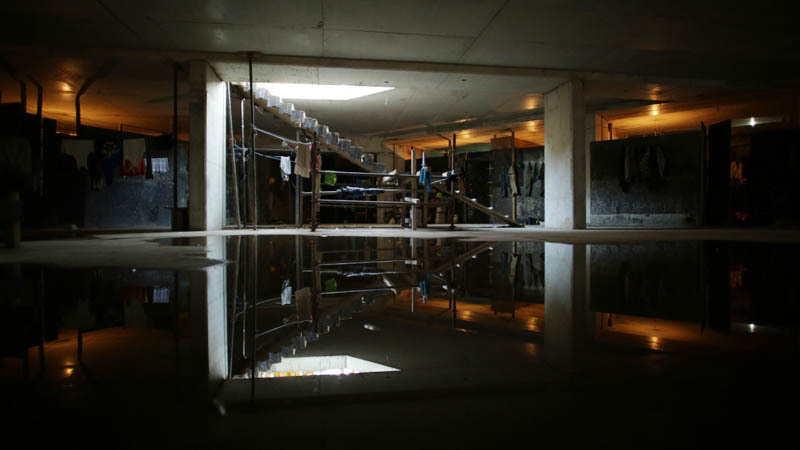 When they aren’t on the job, Syrian construction workers in Beirut, Lebanon, stay in this dark basement full of puddles. They wash their clothes in buckets and hang them on the wall. There was at least one TV down there. Many men use their phones to look at photos or news reports on the devastation back home. Meagre evening meals include oily sardines plonked onto pita directly from the tin, and something that looked like ratatouille, eaten out of a pot. In the morning, a man used a Barbie Pink mirror while shaving. A dollar store find? A gift from a daughter? This living arrangement is not voluntary – a sign says that there is a 7 p.m. curfew for Syrians and that violators will be prosecuted. Essentially, they are a captive workforce, even if they do get paid. I was hoping they weren’t paying anything to live in that basement. Syrian workers in Beirut, Lebanon, must obey a curfew. Nothing could make that basement look welcoming or arty, but the outdoor scenes are another matter. The framing is masterful and many images could be mistaken for still photos if not for waves, or changing images on far-away video billboards. Colours are beautiful – the blue sky, the blue water, orange safety vests, red poles, yellow bulldozers. 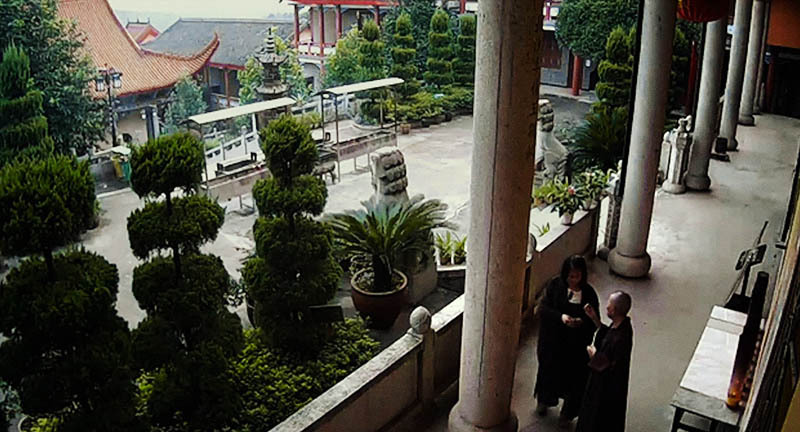 The views from the building are stunning, but the men are probably too busy with work, and trying to stay alive, to notice. Many work without hard hats, or gloves, or harnesses; they are welding and running big saws without safety glasses. Just watching is scary. The film has a narrator – I was not sure if he was supposed to be a specific person, or more of an Everyman. He tells of his father who also did construction work abroad, and whose hands always smelled of cement. He and his father are part of a cycle of destruction and construction. Buildings and cities are destroyed by war and then repaired. Certainly Lebanon has seen its share of destruction. I wonder, the workers must wonder. . .when or if Syria will be repaired? After all, the destruction is still taking place. 1455 de Maisonneuve W., Room H-110, Montreal, as part of the RIDM film festival, which runs until Sunday, Nov. 19, 2017. 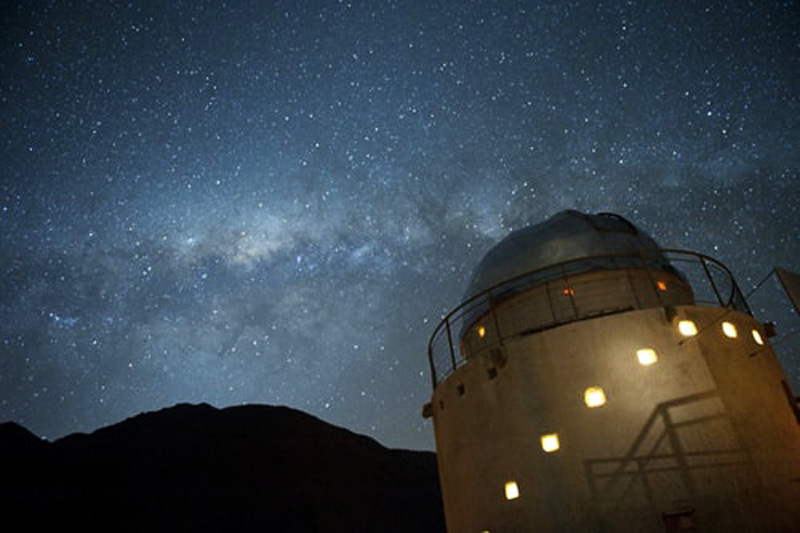 The documentary film Cielo takes us to Chile’s Atacama Desert where the stars shine bright and clear. The documentary film Cielo is set in the Atacama Desert of Chile. I put Cielo on my “must-see list” after seeing extracts from the film at the press conference for Montreal’s RIDM film festival. The film is full of absolutely stunning images of the desert, and night skies full of more stars than you could imagine. And the Milky Way! Just stunning! In time-lapse sequences, the heavens seem to be rotating. The occasional shooting star zips by. The Atacama desert is one of the driest places on earth. That dryness, the desert’s high altitude, and the lack of air pollution and light pollution make it an excellent spot for scientific star gazing and there are several observatories there. There are traditional ones, with big domes and huge telescopes, along with the ALMA (Atacama Large Millimeter/submillimeter Array). That is a single telescope of revolutionary design, composed of 66 high precision antennas located on the Chajnantor plateau, 5,000 meters altitude in northern Chile.” Those antennas look a lot like satellite dishes. When they swivel in time-lapse photography they also look like a field full of disembodied ears. Very weird! Canadian director Alison McAlpine takes us inside a traditional observatory as the dome opes and the telescope is moved into position (cue metallic noises); she talks to astronomers and to people who live in ramshackle dwellings in the desert. They share some local lore, banter about gravity, etc. Because the desert is so inhospitable, I wondered how they managed to survive there. How far do they have to travel for food, etc? One man is a miner, others are described as algae gatherers in the credits and press kit, while others are described as cowboys. I saw their animals so briefly I could not tell if they were goats, llamas or vicuña. From previous films and reading I did not think there would be anything for those animals to eat, but apparently there are some very scrubby grasses. And maybe these animals live in the edge of the desert? There is additional astounding imagery of stars and galaxies that I thought was shot through telescopes, but the press kit revealed that most of that footage is really “organic effects” of the kind seen in Terrence Malick’s Tree of Life. Now for some gentle criticism. Cielo is well worth seeing for the images, but I feel that director McAlpine’s narration does not do it any favours. It might be intrusive no matter what, but because she is addressing the stars, rather than simply sharing them with us, I felt further removed from the film. Hearing her say “Now I can’t stop watching you, I’m trying to understand your crazy beauty,” felt weird, like eavesdropping, maybe. Atacama Desert, astronomy, voice overs – those ingredients might remind you of Patricio Guzman’s Nostalgia de la Luz (Nostalgia For the Light.) While Cielo is worth watching, it does not approach the level of that masterpiece. Guzman’s narration sounded like poetry, in Spanish and in translation, even when he was talking about the atrocities of the Pinochet era. His film juxtaposed the beauty of the stars, the mysteries of the universe with the evil of the dictatorship and the grief of the bereaved who were still searching the desert for the bodies of their murdered loved ones. You can buy or rent Nostalgia for the Light on iTunes (and elsewhere, I imagine). And you really should! Here is a link to the review of Nostalgia for the Light I wrote for the Montreal Gazette in 2011. Cielo is part of RIDM (Rencontres internationales du documentaire de Montréal) runs until Sunday, Nov. 19, 2017. (I found some interesting web sites while doing research for this review. I’ll add them later. Please come back to see them! 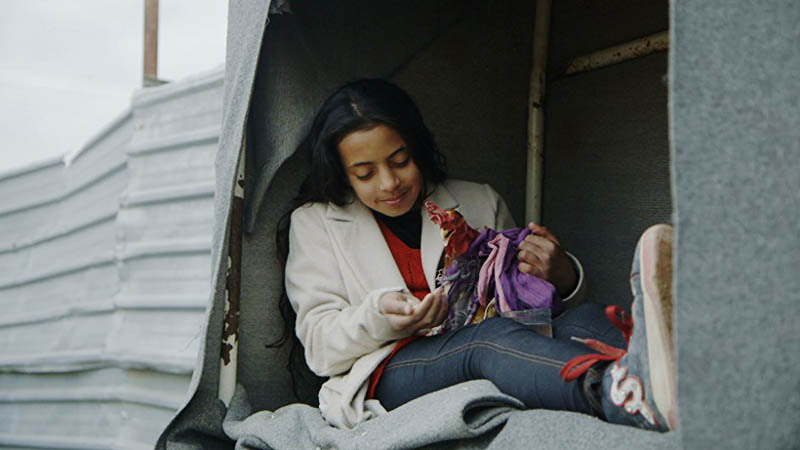 Syrian refugee Fatma plays with her pet rooster in the documentary film Zaatari Djinn. The film is being shown at the documentary film festival RIDM in Montreal. 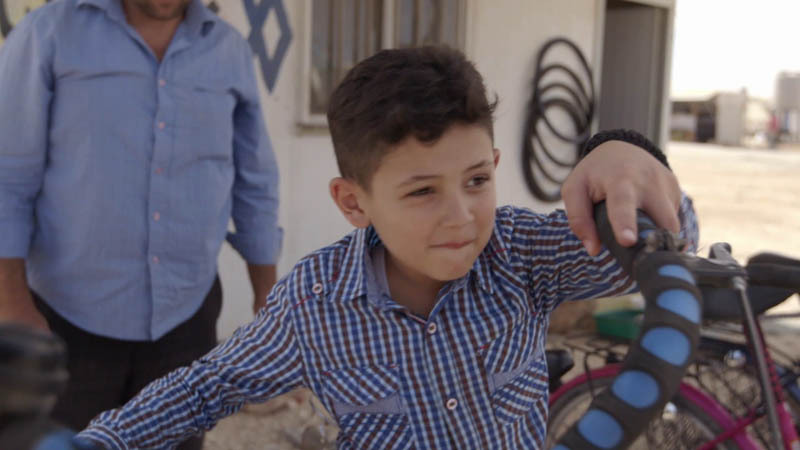 The documentary film Zaatari Djinn shows us what life is like for two girls and two boys in Jordan’s sprawling Zaatari camp, which is home for 80,000 to 100,000 Syrian refugees. In the camp, Fatma, Maryam, Ferras and Hammoudi are at the mercy of their parents, circumstances, and the weather. The place is sometimes sunny, sometimes cloudy, often windy and dusty. The future is uncertain. But despite the many hardships, Zaatari Djinn is frequently lyrical and captivating. So far, it is one of my two favourite films on the RIDM schedule. Thanks to a drama class, Maryam has discovered the joys of acting, but her father does not approve, he says it is against their culture. Interestingly, the play she was rehearsing is Shakespeare’s King Lear, which has its share of father-daughter discord. The film show her happily playing soccer with other girsl, but the press notes say her father made her stop that, too. Ferras walks the streets of the camp, selling the sweets that his father makes. It’s the stuff often called Turkish Delight in the West; they call it raha in Syria. Making it requires lots of stirring with a big wooden stick. Ferras also buys the supplies, mostly sugar and cornstarch, which aren’t always available in sufficient quantities. Ferras doesn’t seem to have much choice about doing this work. While reading about the camp, I found an article online about Ferras and his father. The family had a candy factory in Dara’a, Syria, before the war. Most of the people in the camp are from Dara’a, though Fatma is from Damascus. Syrian refugee Hammoudi chooses a bicycle in the documentary film Zaatari Djinn. The film is being shown at the documentary film festival RIDM in Montreal. Hammoudi is happy when his mother offers to buy him a bicycle, and lets him choose it. He clearly knows so much about them I was surprised that the bicycle seller didn’t offer him a job. When Hammoudi accompanies his mother to the camp hospital, we see a place with modern equipment and doctors who are gentle and friendly with the children. There are many aid-group logos on the walls, and US and EU flag decals. Similarly, I felt distressed and uneasy watching some boys playing what might have been their version of “war“- they pointed toy guns at a playmate, and grabbed him shouting “Lock him up!” I don’t know, seeing children displaced by war playing with (toy) guns, doesn’t seem to bode well for the future. Duration: 90 minutes, in Arabic with English subtitles. Zaatari Djinn will be shown on Sunday, Nov. 12, 2017 at 5 p.m. in Salle 10 of Cineplex Odeon Quartier Latin, 350 rue Émery. In a scene from Aki Kaurismaki’s film The Other Side of Hope, Syrian refugee Khaled (Sherwan Haji), far left, and Wikstrom (Sakari Kuosmanen), far right, wait for customers in Wikstrom’s restaurant. Would it be possible to describe the films of Finnish director Aki Kaurismaki without using the word deadpan? I guess so, but it’s very handy information for anyone not familiar with his work. Another thing to know – there isn’t much talking. (We get looks, silences, and lotsa cool tunes, though!) New arrivals in Helsinki say more in their second or even third language than the native Finns do. There’s an amazing amount of smoking, considering how restricted it is Finland. Maybe it makes the chain-smoking Kaurismaki feel more comfortable when shooting. The Other Side of Hope follows two men, before and after they meet. 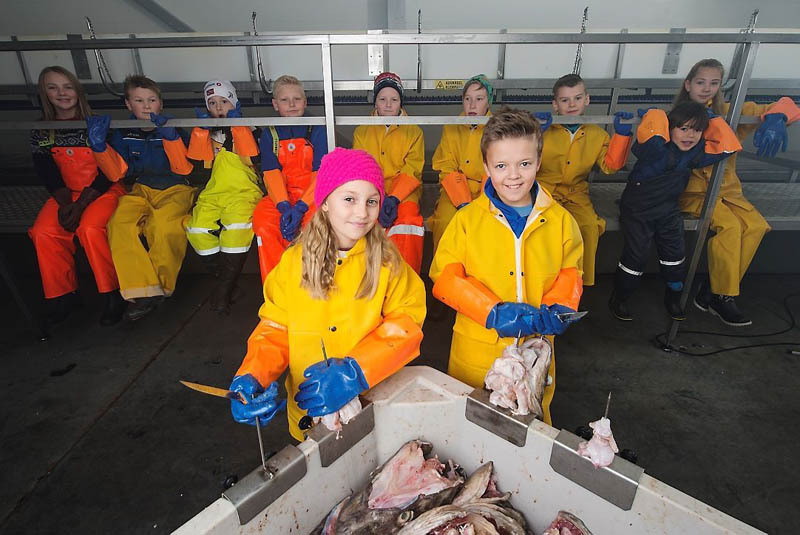 Khaled (Sherwan Haji), is a Syrian asylum-seeker who reaches Finland on a Polish coal boat, and Wikstrom (Sakari Kuosmanen) is a Finn making some big changes in his life. We see him (wordlessly) leave his alcoholic wife, wrap up his small clothing business, and win big at a poker game filled with menacing undertones. It feels appropriate to refer to Wikstrom by his last name because he initially seems stiff and cold, while Khaled is someone easier to relate to. Khaled is a mechanic who left Syria after his house was bombed and most of his family members were killed. The fact that he doesn’t even know who blew up his house – the U.S., Russia, Syria, Hezbollah, or Daesh – shows just how chaotic situation is in Syria. 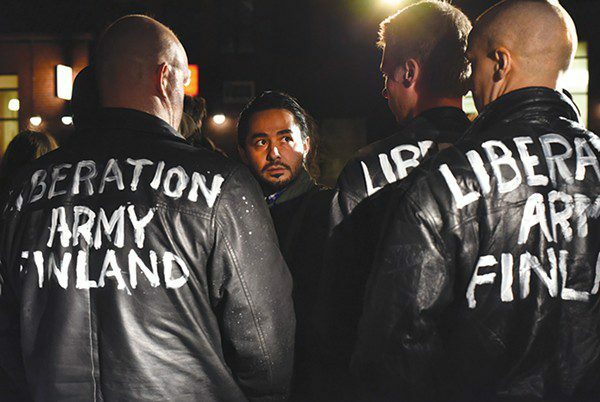 Syrian refugee Khaled (Sherwan Haji) is threatened by vicious thugs in Aki Kaurismaki’s film The Other Side of Hope. Khaled had jumped onto the boat in Gdansk, Poland while fleeing a gang of skinheads. Sadly, he runs into similar thugs in Helsinki. They keep turning up, like three very bad pennies. Luckily for Khaled and our faith in people, there are others who treat him well. These include Wikstrom and the quirky employees he inherits when he buys a small restaurant called the Golden Pint. Efforts to turn it into a fusion place or a Japanese one are quite funny, in a restrained kind of way. Watch for the scene involving wasabi! Speaking of Japanese, call me crazy, but Sherwan Haji reminds me of Japanese actor Takayuki Yamada. Look him up! With The Other Side of Hope Kaurismaki is clearly asking his fellow Europeans, and the rest of us, to have a heart, just as he did the with his earlier film Le Havre (2011).